Medallion Cabinetry at Menards provides efficient organization and storage solutions that are functional and beautiful. 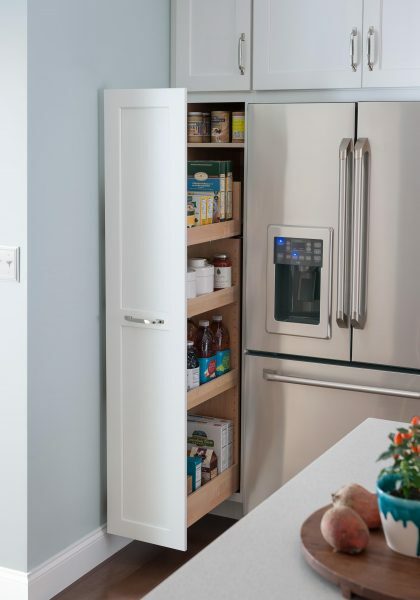 Includes one maple natural pull-out shelving rack fixed to door. Rack is open on both sides and includes one adjustable shelf. Heavy Duty Smartmotion FX is an optional upgrade for cabinets modified to 21″ – 24″ depths. Width modification available in 1/4″ increments; minimum 9″, maximum 18″. Depth modification available: 18″, 21″, and 24″; Custom Quote available for other depths. Available in 30″ heights only; height modification not available.